Islamabad. 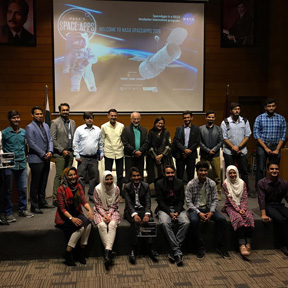 The Millennium Universal College Islamabad (TMUC) hosted a prestigious global hackathon nationwide with NASA, the leading Space agency in the world, on October 20-21, 2018, says a press release. TMUC was the national venue partner with the local lead organizer in Islamabad, Lahore and Karachi. The hackathon was a part of the International Space Apps Challenge that is an international mass collaboration, focused on space exploration that takes place over 48-hours in 250 cities, in more than 160 countries around the world. This year the event was organized all over the world from October 19th till 20th, 2018. Teaming up with technologists, scientists, designers, artists, educators, entrepreneurs, developers and students across the globe, the Hackathon collaborates and engages publicly available data to design innovative solutions for global challenges. TMUC partnered to provide its state-of-the-art facilities for this event in which more than 600 participants both virtually and physically participated to make Pakistan proud by addressing the challenges given by NASA. Manufacturing specialist, founder and chairman of Rastgar group Imtiaz Rastgar was the guest of honor at the event. TMUC supports NASA in it’s commitment to bring together participants from various fields to present solutions to global challenges.